2011 BRITISH Superbike champion Tommy Hill has announced that John Hopkins and Stuart Easton are to ride for his fully-factory supported THM ePayMe Yamaha Team in the British Superbike championship next season. Easton had a strong year in British Superbike with a victory at Oulton Park and a further three podium finishes which placed him in the top six ready for the end of season Showdown title fight. Unfortunately, the Scottish rider was then sidelined through injury after crashing at Brands Hatch in July and was then unable to complete the 2015 season. 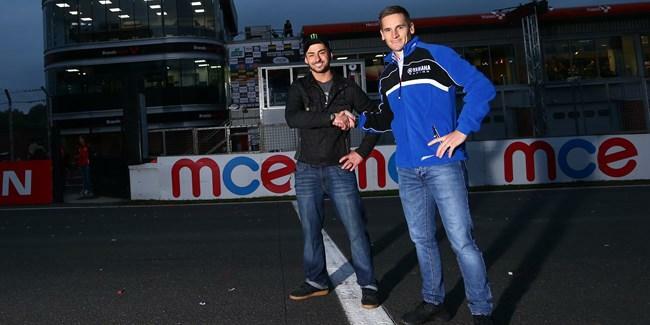 'I am really happy to have joined the THM ePayMe Yamaha team for next season,' said the 32-year-old. 'I have had some great races with Tommy on track, especially two that stand out at Oulton Park, and we have also been team-mates before so it is exciting and surreal to be working together like this in 2016. 'The last time I rode a Yamaha was when I won the British Supersport championship for them in 2013 and so I have some great memories, it might have been a different class but it was still a great bike and I can't wait to test the new YZF-R1. 'Everybody has talked about what a great Superbike it is, and although I haven't ridden it yet, we have seen how strong it was with Josh Brookes onboard this season so full credit to him and the team. Speaking about his injury, the Hawick rider said: 'I was unlucky to have ended this season with the injury, but I feel confident about next season and the new challenge. Lots of people say you are as good as your last race and the last races I did when I was fully fit before my crash and was subsequently injure. I finished in second place twice at Knockhill so that bodes well! Hill announced Hopkins to the team at Brands Hatch – the very place where the pair were once rivals and battled right down to the wire for the 2011 title. America's Hopkins is one of the most experienced riders on the grid having taken podium finishes in the MotoGP Championship and numerous race wins in British Superbikes over the years. 'Honestly I couldn't be more excited, to be able to start the 2016 season on a Yamaha after seeing what it was capable of this year,' said the American. 'Honestly for years, I mean years now, seeing the Yamaha Superbike out on track, I have always just thought in the back of my mind that it was a bike that would really sort my riding style. This new Yamaha R1 is truly something special and honestly I am so excited to just get my first chance to ride it and give it a go.